It is that time of year were pumpkin flavors are emerging. A trip at Trader Joe's reviled a variety of pumpkin flavored products. We saw pumpkin flavored beer, tortilla chips, pumpkin butter, cereal bars, toaster pastries, and I am sure there are more products. We bought the cereal bars and the toaster pastries. I had the pastries for breakfast, it was ok. 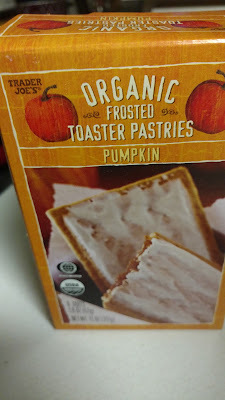 I think I would rather stick with pumpkin pie with lots of whipped cream.